If you’re tired of the same old burger, this Polish recipe for Klupskies (Polish Burgers) will change your mind about burgers. 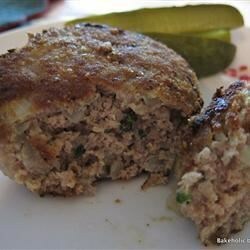 This Klupskie Recipe is so moist and full of flavor that I will probably never eat a regular burger again. It is definitely worth trying out at home. You won’t be disappointed! Mix ground beef, onion, green pepper, egg, ketchup, and sea salt together in a bowl; mix in the white bread pieces until evenly distributed. Form the mixture into 4 patties. Spray a large skillet with olive oil cooking spray and set over medium heat. Cook the burgers until well-browned on the bottoms, about 10 minutes; flip the burgers and cook until the meat is no longer pink and the juices run clear, 8 to 10 more minutes. This entry was posted in Uncategorized on August 24, 2015 by Sara.